In my teens and early 20s social anxiety was wrecking my life. I couldn’t go out and feel comfortable around people without drinking, so I drank. Now, alcohol can lead to a lot of cool stuff but for me it was a crutch and I needed help. I scanned the shelves super fast worrying I’d bump into someone I knew and have to explain why I was looking through a book with some super embarrassing title. I picked one out and went to check out but when I slid the book across the counter all my nervousness came to a head and I had a total panic attack. It turns out changing yourself was going to be really, really hard. Now, did I read that book and cure my social anxiety? No, I read more books, went to therapists, and attended a 12-step group. It was like peeling an onion where I had to keep taking off layers until I got to the core and only from there could I rebuild myself. And what I learned was that implementing new tiny habits into my life ultimately lead to the change I wanted. Here, let me show you one of them. I was sending myself this automated email every day at 8:00 in the morning so when I checked my inbox first thing in the morning I’d see it. It reminded me to greet everyone (at work, on the street, in the gym). This is completely insane, right? You’d think so, but what I discovered was that by “going first” I began to build my social confidence. And when this tiny habit became automatic, meaning I just did it without thinking, then I created another tiny habit, and so on. You might find implementing one tiny habit gets you pretty far. But what if you made it a practice to do it throughout your life? One day you’ll look back and realize you actually changed yourself, even when you thought it was impossible. I’m not the only one who knows the power of tiny habits. I was reading this Quora thread and it was fascinating one guy completely changed his life by implementing a few tiny habits a day: Drinking water, smiling during his commute, and meditating for 10 minutes. Before I get to the one tiny habit that leads to wealth I want to tell you about an economic term called hyperbolic discounting. In simple terms it means you prefer big rewards over small ones. An example of this is if I offered you $100 or $200. You’d take the $200, right? But you have an even stronger preference for present rewards over future ones even when the future ones are bigger. So if I offered you $100 today, or $200 one year from now, which one would you take? Studies show that you’d actually take the $100 because your brain somehow gets short-circuited and overrides logic. And that means you let a future with potentially big results get away (same thing with marshmallows). Now, how can you short-circuit your brain getting short-circuited? 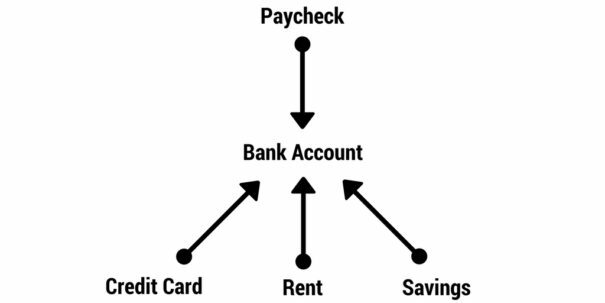 With the one tiny habit of automating your money. Here, let me show you what this looks like. 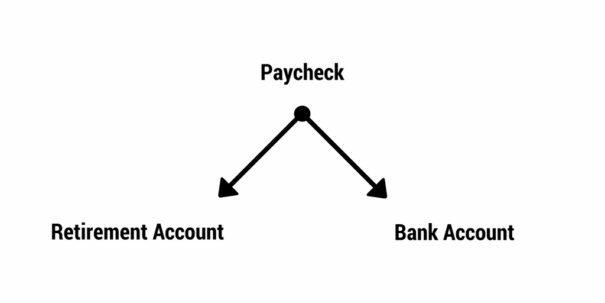 What you do is have money automatically sent from your paycheck to your retirement account. This can be your employer-sponsored 401(k), or if that’s not an option for you, a Roth IRA. Ridiculous, right? Yes, but lots of people don’t do this even when there’s evidence that if you do it it’s extremely effective. I recommend investing 10% of what you earn, which means the remaining 90% of your income goes to your bank account. But you can start with as little as $50. The key is to start saving for retirement rather than doing nothing because you’ll be better off than mostly everyone else. And if you want you can keep building on top of this. You can set up automation for how the money in your bank account gets used. Here, let me show you how. Each month you can automatically pay your student loans, credit cards, and rent. You can automatically set aside money each month for savings. I automated my money years ago and the benefit is I don’t have to make decisions about where my money should go: How much I should invest, what I can spend, do I have enough savings, and so on. Make sense? Okay, good. Now, I’ll let you in on a little secret. This site is really about helping you get the life you want, not about personal finance (and I’m going to start writing more about things like managing your career, and entrepreneurship). I want to get you in the door with something you can implement today, like automating your money, because it’s a tactic of a larger strategy. Because one day, do you want to quit your job you don’t even like? You can do that. Do you want to buy a Birkin bag or a pair of Louboutins without feeling guilty? You can do that. Do you want to travel around the world for a year? You can do that, too. All these things are possible, and it starts with one tiny habit today.